In some cities, late-night food begins with hot dogs, the unbridled joy of a bacon-wrapped dog with onions in LA, or one piled with kraut and spicy mustard in NYC. What Dallas lacks in craveable hot-dog options, it more than makes up for with variety. There’s the Rose burger at Mr Mesero, a picturesque double cheeseburger that’s served until very late. In Downtown Dallas, Wild Salsa is serving steak tacos and quesadillas until midnight on Fridays and Saturdays. 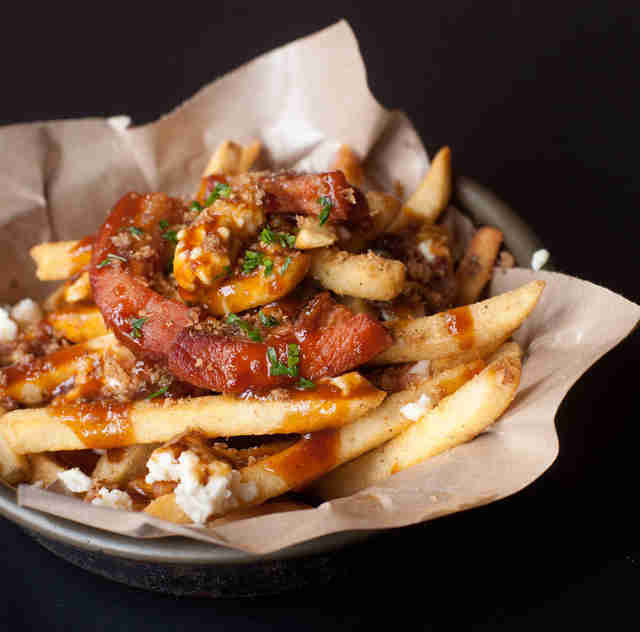 Then, there’s Top Knot's late-night poutine. They’re good, but there is competition. You’ll need a car, or a generous friend, but these 11 post-midnight eats in Dallas are perfect -- whether you’ve had a few or not. 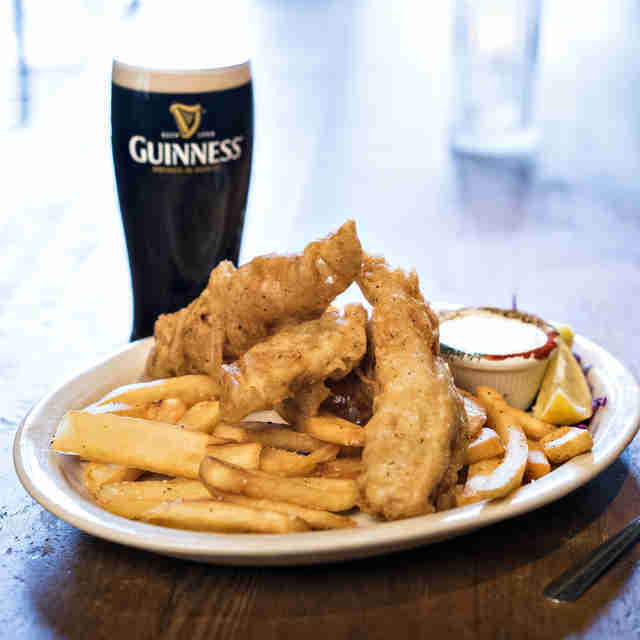 There are a lot of reasons to avoid fish & chips after 10pm, but none of them are good enough to steer you away from Old Monk’s deep-fried strips of Atlantic cod and homemade tartar sauce. The only thing green on the plate is the dill on the rim of the tarter sauce ramekin. Hammer some of that tart malt vinegar all over your deep-fried everything; dip battered fish; and repeat. It’s superb paired with a cold lager. Late-night hours: Open until 2am every night, with a late-night menu that runs 11pm-1am Sunday through Thursday. Yes, you should come taco. Come fish taco, actually. The fried tilapia fish tacos are standouts: crunchy cabbage and pickled red onions, zigzags of savory crema, and bright, fresh-chopped cilantro top the fresh fish. El Come seasons its tilapia nicely, so you’re not getting just bland fried whatever-fish. Squeeze some lime juice over your fish and tortillas for a wake-up call. It’s a top-five fish taco that you won’t regret. Late-night hours: Open until midnight, Friday and Saturday. Open until 10pm Tuesday through Thursday. The tater tot side at Velvet Taco is the late-night Cinemax of eating. After midnight, it gets real dirty. 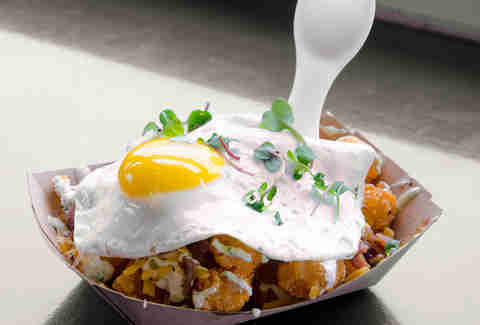 The tater tots are salty and crispy, topped with chunks of goat cheese, nodes of bacon, melted smoked cheddar, a tangy avocado crema, and -- wait for it -- a local sunny-side-up egg. The egg, when jabbed, gets all adult film over everything. Bring lots of napkins to clean up. Late-night hours: Open until 5am on Fridays and Saturdays. Open until 2am Sunday through Thursday. 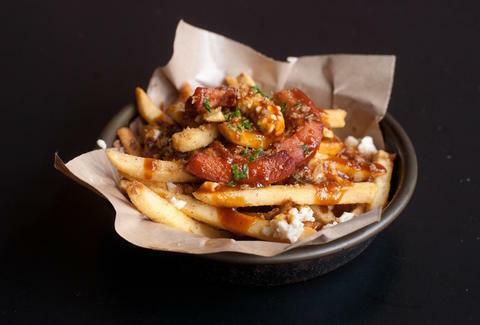 Things have gotten bad for you if you haven’t made it to Blind Butcher for the poutine. Sensational, silky, and smoky gravy, cheese curds, and seared pork belly, tender as you’d hope, top marvelously crispy French fries, because you need to treat yourself like an Edwardian king. Order your tablemates to get you a beer and some bone marrow cake, if you’re in the mood. Late-night hours: Open until 2am every night. 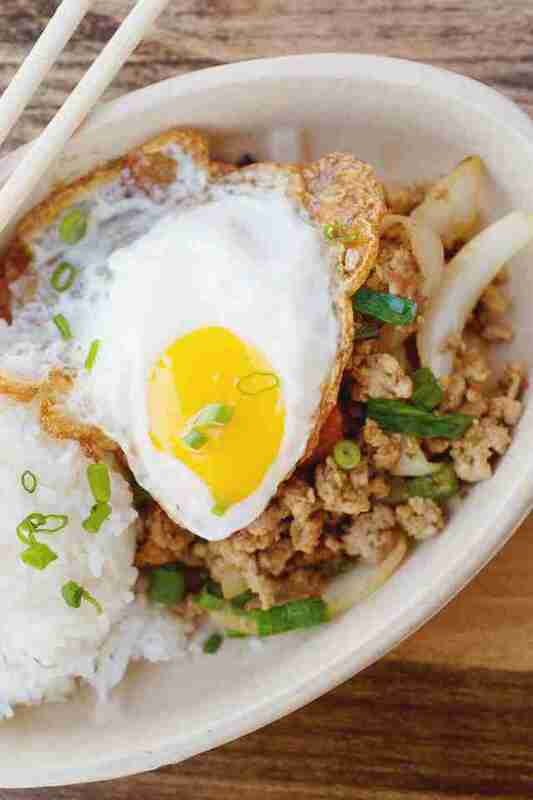 This has got to be one of the best guilty pleasures in Dallas: chicken tossed with scrambled egg, salty-addictive jasmine fried rice, mixed fresh onions, and a cucumber relish that will make your brain’s lobes stand up and yell. A fried egg is laid over the whole thing, which is never bad. Make sure you get a side of the spicy nahm jim sauce. Late-night hours: Open until 3am Fridays and Saturdays. Courtesy of The Armoury D.E. 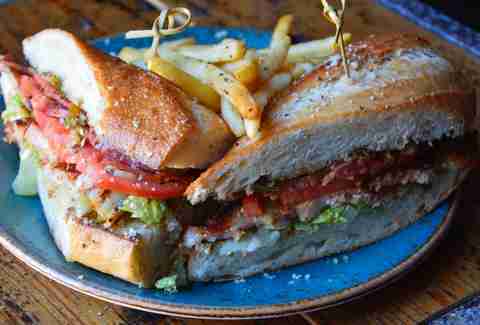 Five years ago, you never would have guessed that Deep Ellum would have stellar Hungarian-inspired bar food. The Armoury’s doing burgers and sandwiches right: the Csavargó is pork belly and paprika-dusted sausage, sparking with a sliced jalapeño and a bold mustard. A chunky bread gives depth. It’s a sandwich that lights up your brain. 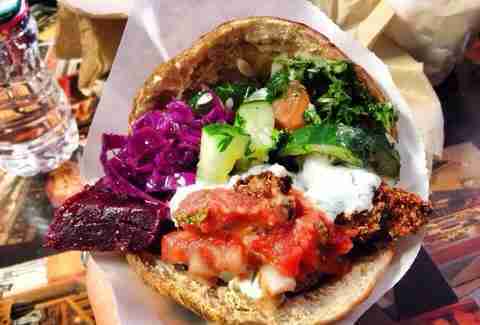 When five crispy spheres of falafel hit pita after 1am, good things are happening. At Deep Ellum’s new fast-casual falafel & gyro shop, you order your main protein first, then work down a line of pickled, spicy, and delicious sides. Spoon on pickles and tabbouleh, onions, spicy tomatoes, and garlic sauces. This is the best part of Amsterdam: the combinations are an electric joy. Late-night hours: Open until 3am Wednesday through Saturday. Open until midnight Sunday through Tuesday. Yes, there is plenty of late-night pho at DaLat. There’s also a dish made with Doritos. 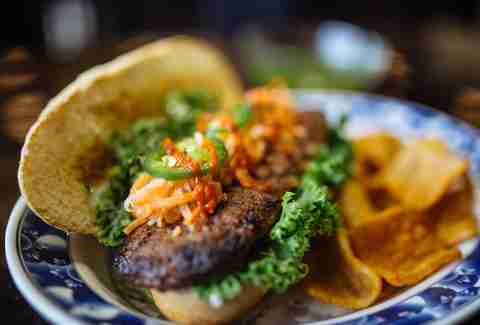 But, after a beer or seven, what you really need is seared, crusty pork burger on a clever banh mi roll. You need a fried egg that runs into a meaty burger when you slice it down the center. It’s one of the more underrated, atypical sandwiches in Dallas. Spicy and pickled Korean food and cold beer is life medicine. Dal Dong will provide much-needed banchan, small dishes served alongside dishes, that span the table. Get a crispy-edged pancake, dip it into the center of that salty sauce, add pickled things, and repeat. When washed down with cold hair of the dog, moods improves dramatically. You know what we do really well in Dallas? Elevated bar food. At Nova, late into the evening, potato skins aren’t boring. 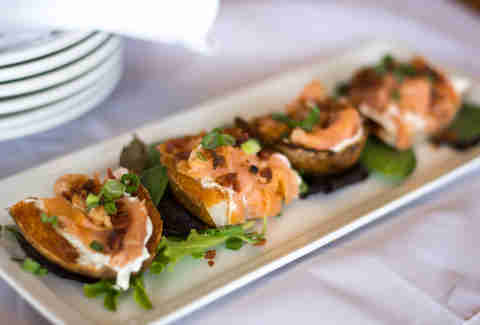 They’re not filled with glossy cheddar: these potato skins are layered with smoke-kissed salmon, crunchy, salty bacon, and creme fraiche. Chopped green onions, showered over the top, give them some herbaceous crunch. You won’t get the frozen ones from chain spots ever again. Late-night hours: Open until midnight Monday through Sunday.. This is late-night-food row. Right next to DaLat’s Vietnamese comfort food and El Come’s fish taco is one of Dallas’ best delivery pizza joints. The pizzas are sublime munchie material in the guise of a New York slice. 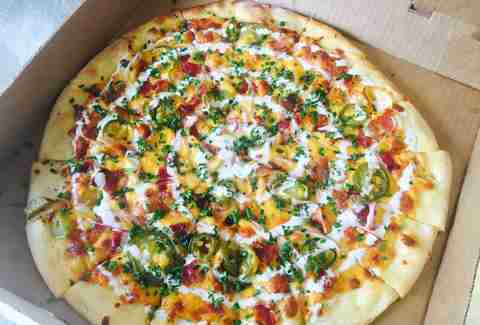 For less than a large pie at Greenville Avenue Pizza Company, Zalat’s firing up great 18in cheese and chunky sausage pizzas -- with sides of Sriracha-spiked ranch dressing -- that you can get with a simple text message. It also has Reuben pizza that’ll knock you clean off your feet. Late-night hours: Available for delivery until 4am every night; you can also order candy. Nick Rallo is a writer in Dallas, and he's considering starting a business where you can chicken-fry anything. Follow him @nickrallo.